When you initially installed the free Newsbin Pro software, you were asked to put in the information for your Usenet account on Usenet Storm. Some folks end up changing news servers or invest in multiple news servers. Here you can add or change a server or set the number of connections and the priority for the news server. For those that are noticing that their headers are not completely downloaded, that can also be fixed here. You'll have to hit the Really Advanced button and then Disable XFeatures. You should notice right away that Newsbin is downloading the entire header list without the program stopping midway through. You'll notice that many times there are tens of thousands, and sometimes millions, of files to go through with Newsbin. Some news groups might have over a billion files to download. Navigating through that can be nearly impossible with any newsreader client. 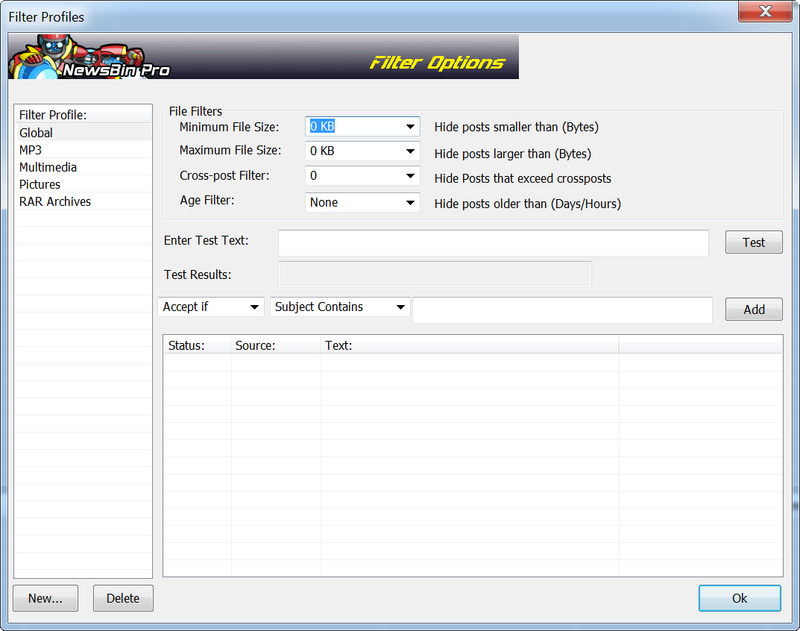 One way to deal with the volume of posts is to employ filters with Newsbin Pro. Here you can tell Newsbin to disregard posts that are smaller than a certain size, larger than a certain size, or have exceeded a certain number of cross-posts. You can also tell it to accept or disregard a post based on a certain set of self-defined rules. This is where a lot of the magic happens. You'll notice that most news servers have over 100,000 different choices to choose from with new categories and new content being added every day. What you select from here will show up in Newsbin Pro's Groups List tab. You'll be able to download the headers for these groups and explore the content therein. You'll also want to be careful, however. These forums help to provide users with a truly anonymous way to talk and to share files. That can be good and bad. In a world where the internet is dominated by major corporations, Usenet is the last true frontier. Content of all kinds is shared, including some that you would never have known existed any other way. With ISP's now throttling transfer methods like torrents, forums like this provide a singular way to sidestep their attacks on Internet freedom. Having been originally conceived of as a message board system, it evolved to be able to share binary files. While the Internet advanced in one direction, Usenet hung around in the background with its legions of faithful users tending the flame that kept it alive using software like Newsbin Pro. Today, it remains as awkward as ever to navigate and use for the purpose of file sharing, but it's a vital resource in an era where there is no privacy and major telecom companies can determine what content you see and how you see it. For that reason, it's garnered increased interest recently as more users flock to the message boards looking for the privacy they once took for granted. And there's another good reason Usenet has become so popular: it’s actually blazingly fast. So with all that in mind, we're going to explore the most efficient way to start using Newsbin. Most providers afford their users a great number of groups to choose from. Over 100,000 is common. Sorting through them to find what you're looking for can be painful, even with the help of good newsreader software. 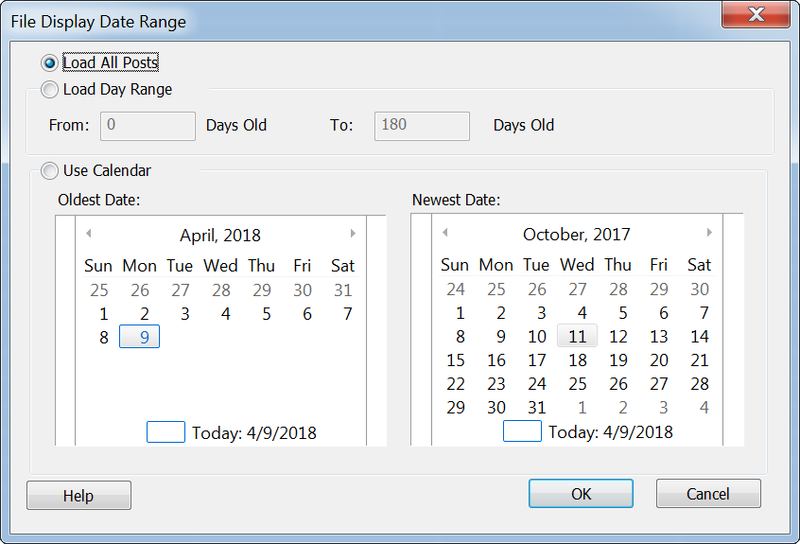 Nonetheless, Newsbin Pro offers some decent features for reducing the overwhelming number of options. Newsgroups are displayed in a sort of hierarchy. For instance, alt.binaries. * tends to be incredibly popular. You can sort out all the options that are in a hierarchy by typing the term into Newsbin's search box. You can refine your query further from here. For instance, if you’re looking for pictures, you can select alt.binaries.pictures. In addition, Newsbin offers other features and switches that can further refine a query. For instance, you can cut out categories that have less than 10,000 posts. It also helps to remove the groups to which you've already subscribed from the list. How Do I Access a Group in Newsbin Pro? In order for a newsreader client to read a group, you first have to subscribe to the group by adding it to your list. This does not mean that you pay for anything more, adding it to your Newsbin Pro software is free and is just called subscribing because your newsreader software keeps up with what comes in to that group. You can do this from the Add Groups selection under Options from the main menu. 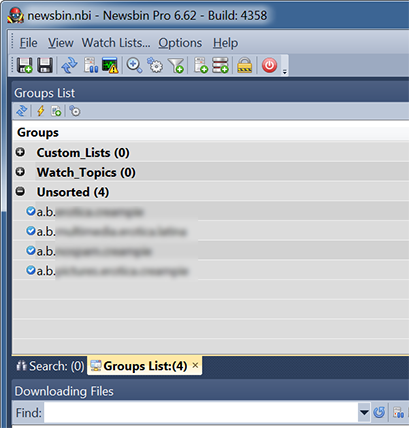 See Adding Groups to Newsbin for more information. You'll then want to have Newsbin download the headers. This can be done by selecting your new group, and then right-clicking on it. Select Download Special => Download All Headers. This will download all the headers from the group going as far back as your provider's retention allows. There have been no new posts in the last several years (or as far back as your provider stores data). Newsbin Pro needs to load older posts from the disk. 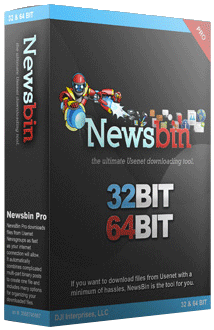 When you are comfortable with searching Usenet with Newsbin Pro, it is time to try the system for browsing groups. Browsing essentially gives you direct access to everything. If you search for 'sports car' you might miss a post in the group alt.binaries.pictures.automobiles that has a title of '2017 Corvette Stingray', but if you are browsing that newsgroup you will never miss what you want because they are named by category or interest. In Newsbin, click on the 'Groups List' tab that is half way down the left side of the screen. Click the 3rd button from the right, in the top menu. It says "Open the Group Add Window", if you put your mouse over it. Use the box by the "Search" button to find categories with a specific word. Double click on any group that you want to add to your list and click 'OK'. Think of this as bookmarking it for later. 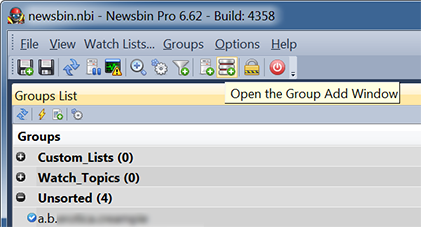 You can now double click on a newsgroup, and Newsbin Pro will start downloading the list of messages automatically. It will then show you the progress as it downloads. When Newsbin finishes downloading the list of messages, they will be shown in the top window and are ready for browsing.